Scott Bridge Company, Inc.'s roots date back to 1933 when Mr. I. J. Scott (Jud) and two partners formed Scott Construction Company in Thomasville, Georgia, constructing many highways, airports, bridges, and dams in the Southeast. Mr. Scott left this firm in 1957 and formed his own company, The Scott Company, in Opelika, Alabama, his home. The Scott Company incorporated in 1965 as Scott Bridge Company with I. J. Scott and his son, I. J. Scott, Jr. Also in 1965 Mr. Gerard Swarthout came to the company, became company president, and retired in 1987. 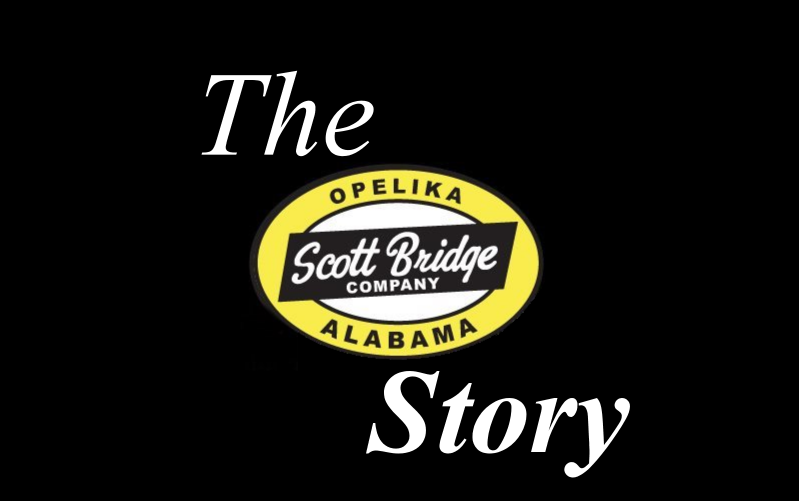 Scott Bridge Company has been a member of the Alabama Road Builders since 1947, and became known as a river bridge contractor, completing many projects on the Warrior, Alabama, Coosa, Tennessee, and Chattahoochee Rivers. Currently Mr. I. J. Scott's grandsons, I. J. Scott, III (Ike), President, William Scott, Vice President and David Scott, Board Member, own and continue to further the principles and traditions of their father and grandfather before them. The story of Scott Bridge Company begins with its founder, Mr. I.J. Scott, Sr. We would like give those who are not familiar with the history of our company some idea of the rare and unique history and tradition with this article. Mr. I. J. Scott, Sr., affectionately known as "Cap'n Jud", has been described as a "true southern gentlemen." If there was one phrase that best represents how most people felt about Cap'n Jud, it would be "he was one of a kind." It is our hope that after reading this article you will understand why everyone that had the opportunity to know Cap'n Jud has said it was a privilege and a blessing. Cap'n Jud was born in 1904 in Rockdale, Georgia. His construction career began in 1921 with the Brooks-Calloway Company, an Atlanta railroad contractor. In 1925 his work took him through Opelika, Alabama where he met, fell in love with and married Miss Frances Morgan. From the day he was married, Opelika was home to Cap'n Jud. Cap'n Jud was a devoted husband, loving father and grandfather, philanthropist, and first-class citizen. In 1933, Cap'n Jud, along with W.F. Scott and W.A. Britton, started Scott Construction Co. in Thomasville, GA., building bridges, highways and dams all over the southeast. During World War II, they even built airport runways. In 1957, Scott Construction Company separated into two companies, with Jud Scott owning The Scott Company. The Scott Company, from that time forward, confined their operations to Jud Scott’s specialty, bridge construction. The Company, later called Scott Bridge Co., Inc., became known for its expertise in deep water cofferdams in bridge construction over water, completing many projects on the Warrior, Alabama, Coosa, Tennessee, and Chattahoochee Rivers. In 1972, when Scott Bridge Company built the Kowliga Bridge, it included the deepest cofferdams ever built in the United States. The company was a partnership whose partners included his son, I.J. Scott, Jr. and his grandsons, who were still children at the time. It was the hope of both Scotts, Senior and Junior that in the years to come the boys would wish to become active in the business. Mr. Scott was respected and admired by all of his employees and his employees were dedicated and loyal. He earned this type of respect by being known as a fair, generous boss. He felt his employees were the backbone of his business. Cecil and Patsy Smith are two employees that have been with Scott Bridge all their lives. Patsy’s father, Kirby Black, was a Superintendent with the Scott Company when she was born. Patsy doesn’t have many memories that don’t include the Scott Company as part of them. She even married a Scott Bridge man, Cecil Smith. E.J. Black, General Superintendent, Kirby Black, and Cap’n Jud can take credit for turning Cecil into one of the most respected bridge men in the Southeast. Patsy’s dad told her the story of how Cap’n Jud would get to the jobsite early and watch when each employee would arrive for work. She said he didn’t have to write anything down, he could remember everything. He would drive his car down to the work site, with tree limbs scraping his car. The next time he came they could see where he had taken a paint brush and painted over the scratches. Patsy said Cap’n Jud was one of a kind and loved by all that worked for him. He was a man of integrity. His word was his bond. Cap’n Jud was somewhat of a legend when it came to bidding for jobs. Before computers, on the mornings on which bids were read, contractors would gather at the hotels in the city where the job was being bid. Contractors would get their bids together. There was always speculation as to who would get the job. People would say if you didn’t see Cap’n Jud around, he was sure to get the job. He would come to town the day before bids were taken and would leave before the job was bid. He knew what a good job should cost, put his profit in his bid and got the job done without fanfare. Even after he retired, (and computers started being used to work up the bid), the engineers would spend hours putting the bid together. Cap’n Jud would work up the bid by hand and tell you exactly what the bid was going to be, or should have been. In 1965, the Scott Company changed its name to Scott Bridge Company, Inc., and I. J. Scott, Jr. served as secretary-treasurer. Although "Cap'n Jud" officially retired in 1975, he still came to the office daily. He loved conversations about bridge building, politics, the economy or anything else you could think to talk about. He was a Democratic Elector to two National Conventions in 1964 and 1968. After the Supreme Court threw prayer and the Ten Commandments out of public schools, Cap'n Jud founded Scott Preparatory School, which later became Lee-Scott Academy, one of the leading independent schools in the State of Alabama today. A man that was truly committed to the highest principals, of faith, family and freedom, Cap'n Jud was a proud and patriotic American, active on numerous boards and associations affiliated with the transportation industry. He became a member of the Alabama Roadbuilders Association in 1957, serving as Board and Committee member. His greatest contribution to the ARBA was through his political work with the Executive and Legislative branches of State Government for over three decades. He was dedicated to building the State's infrastructure and worked diligently to accomplish this. For his hard work and efforts, Cap'n Jud was inducted into the Alabama Roadbuilders Hall of Fame in 2008. As dedicated as he was to his business, he was even more dedicated to the betterment of his “adopted” hometown. His contributions to his community were enormous as he believed a person has an obligation to give back to the community more than what you have received from it. During World War II he bought the old armory building and rebuilt it for the use of the young people of Opelika as a recreation center. Cap'n Jud was honored by his “adopted hometown” in 1975 when he was named the “Distinguished Citizen of the Year” by the City of Opelika. Cap'n Jud was deeply committed to the church he attended for over 50 years, First Baptist Church of Opelika. The beautiful lighted steeple that still remains on top of the First Baptist Church was a gift of Mr. and Mrs. Scott to their church that they loved so. He served many years as a Deacon and Chairman of the Building Committee. The pew he sat in every Sunday now occupies a place in the executive conference room at the corporate office in Opelika, Alabama. When the church renovated the sanctuary and replaced the wooden pews with cushioned pews, Ike Scott purchased the pew that Captain Jud had spent so many Sundays sitting on. The story of the pew and what it means to the Scott family is a story that will be told for many years to come. Cap'n Jud preferred that his acts of kindness remain anonymous. Rick Hagans, Pastor, founder of Harvest Evangelism, and speaker at our 2010 Management meeting, told a story that no one in the Scott family had heard. When Rick was a young boy, he suffered a serious injury to his back and his parents were told without surgery, he would probably lose the ability to walk. His parents did not have health insurance or the money for the surgery. Cap'n Jud heard Rick's story. He told the doctor to do whatever was necessary, that he would be responsible for the cost of the surgery. Rick had never before shared that story with his friend, Ike Scott. Rick annually walks across the United States to raise money to buy shoes for orphans in the orphanage that his ministry supports in Mexico. Rick Hagans’ ministry that benefits so many people, would probably not have not been possible without the kindness and generosity of Cap'n Jud. Cap'n Jud remained active even after his retirement in 1975. He was a frequent contributor and writer of editorials to the local newspaper, never hesitating to take up pen and paper and make his opinion known, whether it was about politics, religion or paying tribute to his beloved wife of fifty years, Mrs. Frances. Cap'n Jud never tired of telling the story of how he met and fell in love with the most beautiful woman he had ever laid his eyes upon. As Scott Bridge nears its 80th anniversary, there is no doubt Cap'n Jud would be very happy with the company he founded. Ike Scott represents the third generation of his family at the Company’s helm, and his two daughters are already involved in company projects and administration. Along with his two brothers, Bill and David, in the business, there are eight children between them that could continue the family ownership. Ike Scott says he sees stewardship of the company as his duty to his family. “I feel like my granddad and my dad gave me an opportunity to succeed, and I feel like I have a responsibility to pass the same opportunity along to my children,” Scott says. He considers it a blessing to be a part of what he calls a vanishing breed – the family company. However, he says that the company can’t take full credit for its success, and looks to a higher power in gratitude. “God has truly blessed Scott Bridge Company and we give Him all the glory,” Scott says. We will continue to lead our company with the same principals taught to us by our grandfather and father.